Dallas, TX – Some Carrollton-Farmers Branch elementary students are in the "greeting card" business this year. KERA's BJ Austin says it's a money-making idea from the district's Educational Foundation - which is working to help fill the gap left by state budget cuts. Dallas, TX – The midnight deadline has passed for excess Dallas teachers to take a resignation deal. 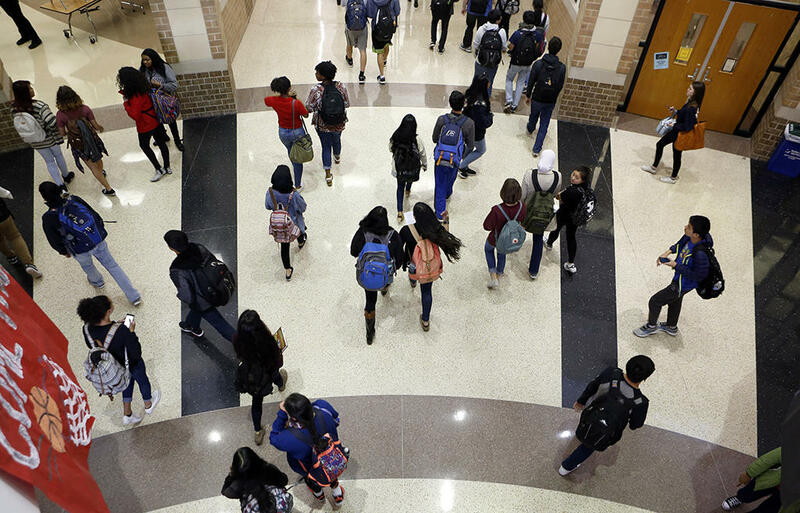 KERA's Bill Zeeble reports the school district doesn't yet know how many took the offer, prompted by the state's education budget cuts. Dallas, TX – A Dallas non-profit is trying to raise awareness about students with time on their hands after school and no safe place to spend it. KERA's Courtney Collins explains. A special event at the Dallas After School Network kicked off with a demonstration by Marsh Middle School's Junior ROTC. Eighth grader Sandra Diaz is very involved with that program and spends hours after school practicing marching and drills. Dallas, TX – This week, the Mesquite School District won another top honor for student achievement. KERA's Bill Zeeble has more on Mesquite's winning formula. In classroom - Starla Richter: Does a poem always have to rhyme? Students: No. Third grade teacher Starla Richter is teaching language arts using poetry examples flashed on a screen. Learning here is fun, the quizzing is like a game. Children speak the answers, but can also click them on a handheld device. Dallas, TX – Students in Tarrant County who have been squinting at the blackboard all year were given the gift of sight today. KERA's Courtney Collins explains. Most sixth grade girls don't beam over a pair of prescription glasses, but Karen says her chic, Juicy Couture frames are as stylish as any accessory. Karen: "I picked out some glasses that are purple on the outside and green on the inside." What was expected to be a routine vote on a state proposition to extend a low-interest student loan program may have run into a political buzz-saw called the Texas Tea Party. Texas Public Radio's David Martin Davies has more. Fort Worth – As Fort Worth schools continue struggling with a state budget shortfall of up to $80 million over the next 2 years, the district is still considering cuts to some or all of its all-day pre-kindergarten program, including pre-k assistants. KERA's Bill Zeeble explains.